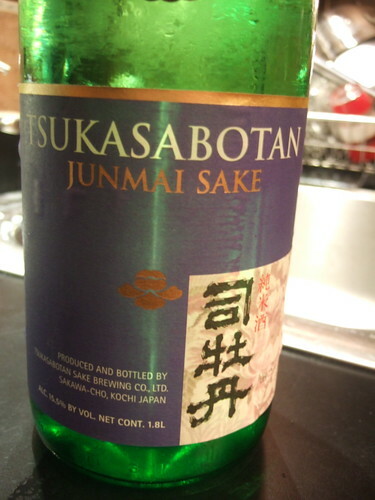 Photo: 1.8-liter bottle (isshōbin) of Tsukasabotan junmai sake. $49.95 at H-Mart in Falls Church. A recent Japanese staple supply trip required making an inventory of the pantry, renting a Zipcar for a few hours, and driving to the H-Mart Korean supermarket in Falls Church, Virginia. We loaded up on katsuobushi, saikyo miso, kombu, hot peppers for Carlos, of course some kimchi, and then decided ruefully not to buy a tabletop propane burner to make nabe this winter. While Carlos was looking at Korean noodle soup packets, I found myself meditating in front of a few shelves of sake and shochu. A few bottles of reasonably drinkable sakes were mixed with the ubiquitous Shochikubai California-made stuff. Ah! 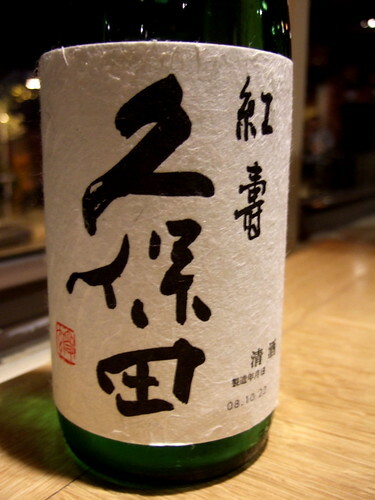 A daiginjo, I pull the bottle down and reading the price is like a slap in the face. I put it back. But on the bottom shelf is a 1.8-liter bottle of Tsukasabotan junmai. It’s a big bottle (called a isshōbin in Japanese); a normal bottle of sake is 720 ml, which is slightly smaller than the normal wine bottle of 750 ml. Too much, I think, I can’t drink all this, but the price is good, $49.95. That’s $49.95 for more than two bottles’ worth of this very good brand of sake that I have enjoyed many times in Japan. And the bottle had the shipping date on it, which allowed me to see it was just nearing the end of one year, getting too old for being out on a shelf, but still fresh enough if (if!) it had been handled well. I’ve written a few times in passing about how drinking sake in Japan used to be my reasonably priced hobby, but sometimes I start doubting my memory of life in Japan. All the places I see in DC that serve sake, for example, SEI, with the slick decor and the slick people drinking sake (or worse, saketinis), why does it often strike me as ludicrous even as I indulge myself? Well, one reason is price. Good sake is just too expensive here and thus it becomes a symbol of conspicuous consumption, rather than something delicious to relax with and enjoy at your local izakaya. I was thinking about this as I cradled that big bottle of Tsukasabotan in my arms. Sushi Taro, bottle of sake, lovely evening out, but $70 for Kubota kōju tokubetsu junmai? Makes me want to tear my hair out. What could this possibly cost in Japan? According to my friends in Tokyo, about ¥1500 ($17). Yes! That’s how I remember it, $15 to $20 gets you a good bottle of sake. In this particular case, some of this is restaurant markup, but in general once a sake has been shipped to and taxed in the United States, the same bottles of sake are at least twice and sometimes three times the price. My big bottle of Tsukasabotan really was a good deal. I’m going to look carefully at the big isshōbin bottles from now on. But for me to buy sake in this area, I have to schlep out to various markets in Virginia and Maryland. The selection is never great and I can never know how well the sake was treated in the store (too much heat, too much time). Feeling sort of depressed about the whole issue of sake prices, and not wanting to stop drinking the stuff, I decided to talk to Rick and Hiroko at SakayaNYC. Photo: Box of happiness purchased from Sakaya NYC. 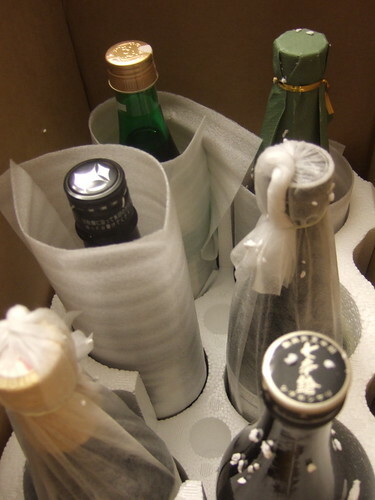 Six bottles of fantastic sake cost $– well, Madam must have some secrets. Hiroko cheers me up with some sake talk and tells me she’ll include one old-fashioned sake that can be slightly warmed (another whole post). OK, so this is not a cheap option, but I think their prices are similar to ones I’ve seen in the DC area (which is they probably hover around twice the price in Japan). Sakaya sells sakes that are significantly higher in quality and I was able to pick from among some of the best breweries in Japan. Six bottles of joy in a box. Six tastings to report in the future. Some budgeting to do to keep sake in my life. By the way, the Tsukasabotan had a full mouthfeel, with a creamy start and sweet-tart aftertaste, the nose was banana with undertones of bamboo. It was getting a little old, I think, but it was delicious. It’s an all-around sake, nothing too out of balance, with enough body to go with food. ETA: Timothy at UrbanSake.com has a video showing various sake bottle sizes. Okay Madam. you will be sure to tell us where to indulge in great Japanese in NYC but it won’t be the same without you there guiding us. Maybe just medium priced? Possible? Here’s one recommendation. Here’s another. Anyway, thanks for this post. I hope Japanese government can negotiate tax in the future. We play a lot of “Where’d the sake go?” Did the elves drink it?